What happens when a group of girls who loves makeup get together to check-out the newest store of Benefit Philippines at SM Mall of Asia? They wear a Hard Hat and go crazy! Because I live at downtown Manila, it is really difficult for me to travel to Shangri-la Mall or even Glorietta/Greenbelt. These places aren't far but from where I live, traffic always gets the best of me so I'd rather stay and sulk at home! When I got an invite to take a peak at the newest Benefit Cosmetics store at SM Mall of Asia, I made a mental leap of joy as SM MOA is definitely nearer to where I live and I'm glad they opened up a store for me to get my Benefit Fix anytime of the day! I mean, if I can't, there's always Mr. AMW who works nearby to help me pick out the products I'd love to purchase! So here's an early peak on how Benefit Store looks like at SM Mall of Asia! The usual girly Benefit wallpapers were used and the "feel-at-home" interiors! Imagine Benefit Greenbelt branch layout but more spacious! Benefit goodies with proper testers all lined up for the opening! Benefit skincare products. Please try Benefit Remove It Makeup Remover, it's oil-free and never stings the eye. Then there's face makeup. The cult favorite Hello Flawless Oxygen Wow Brightening Makeup in which I highly recommend for daily use. And there's also the Hello Flawless Custom Powder Cover-Up which works best on its own or pick 2-3 shades darker than your skin color and use as a contouring powder. To those who prefers heavier coverage, they also have Benefit Play Sticks Foundation in which I enjoy using on photoshoots! I will share a review once I get the chance. What else is there to check out? Primers! Benefit's Porefessional is one of my most favorite Benefit product. I actually do not use it for myself but on clients who have obvious-looking pores! If you look closely, you'll definitely see something new from Benefit, the Stay Flawless 15 hour primer for the face! These will be available on August! I am lucky enough to use this on Benefit shoot a month ago and so far, this primer looks promising in terms of performance, I have to admit, it is quite tricky to use and apply but once you get the hang of it, it's worth the practice! Brow products, mascaras, eyeshadows and eyeliners! 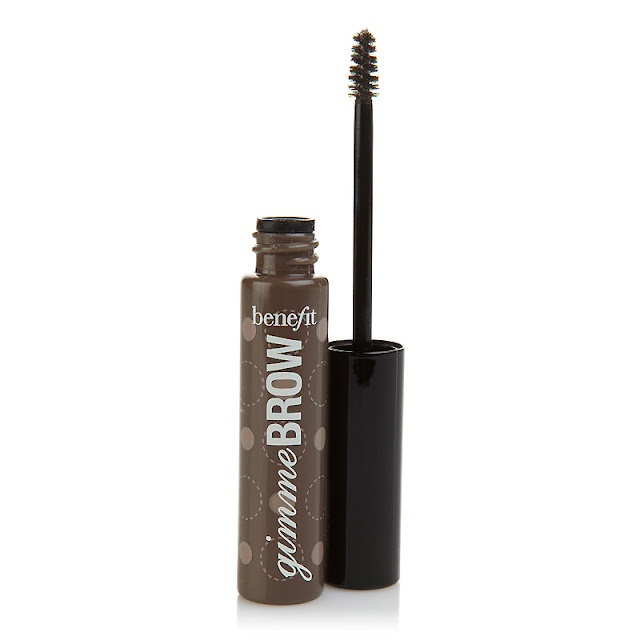 They are also coming out with the new Benefit GIMME BROW! This is a wonderful tinted "mascara-like" product that's meant to be applied on your brows to give a hint of color and gives an illusion of fuller-looking brows minus the drama! I'm glad they came with 2 shades (medium brown and light brown). What caught my attention? More How to Look The Best at Everything Palette! I highly recommend this palette for first time buyers! You get to try their bestselling Porefessional, Hello Flawless Oxygen Wow, Boi-ing Concealer and Hello Flawless Powder! Now let's head on to what you can expect at the Benefit store, the Boxed Powders - my ultimate favorite! I am currently collecting these boxed powders and will do my best to complete them! And you would think you've had enough of these? Look at the photo below and tell me what's new! The tint + gloss combo called Pocket Pal! The lip/cheek stain and clear gloss combo. These are housed in a lipgloss packaging for ease of application. There's the Posietint + gloss, Benetint + gloss and Chachatint + gloss combo! And what's more exciting? The newest makeup collection called Colors by Benefit! The Benefit Creaseless Creams housed in better-looking glass packaging! The nice range of eyeshadows, lipsticks that are very pigmented and shades worth checking out for! And last but not the least, the Benefit Plush Gloss which comes in variety of shades that are VERY pigmented and are definitely non-sticky! I've used these on shoots as well Sam Pinto got a lot of query on what lipstick shade she used and to be honest, I only used a Plush Gloss, that's how pigmented they are people mistake them for very moisturizing lipstick. Another highlight of the store? The waxing room! Definitely bigger space for a more comfortable waxing session! A quick makeup demo was done by Porefessor of Beauty RJ with gorgeous model Donna (Sales from Benefit Team). For demonstration purpose, medium brown Gimme Brow was used on Donna's right eyebrow (left facing you) and light colored was used on her left eyebrow (right facing you). You can see a whole difference of brows applied with Benefit Gimme Brow even without any other brow products. I can't wait to try this on my own brows! I've always been longing for Benefit to have such product and thank goodness my wish came true! I want to congratulate Benefit team in advance for the lovely SM Mall of Asia branch and I'm sure the opening will be a huge success this Friday (July 26, 2013). Are you going to check out Benefit SM Mall of Asia branch? Which Benefit Product do you plan to purchase? Good choices of Benefit products you want to try! Oh Jenn, you guys do not have a physical Benefit store? No wonder PB and the rest loves to order in the US! Acidic - definitely go for shade or two lighter.. check how many shades lighter you need to purchase by ttrying out testers. Sensitive skin, naku...hmm..so many products made for sensitive skin but you really have to do a patch test, mahirap na! I cant wait to visit this branch.. I guess this branch is nearest to you? I love SM MOA branch! It is way nearer to me so I'm excited to have my brow services done there!